Today as in the past, customer service for a product is just as important as the product itself and yet throughout the world this function of a business often gets lesser attention. At this point, depending on the type of problem, one can choose the method of contact, however, each method will get help for their software problem. Each item in this list provides a different set of helps for all AQ users. 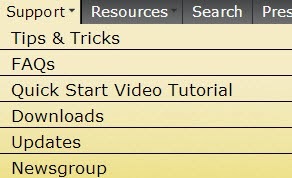 The "Tips & Tricks" section covers a variety of topics beginning with "Distributing Your Multimedia Genealogy CD" and a variety of other help topics. FAQ's covers a long list of questions from General Program Questions to a special section on PAF and AQ and additional technical questions. The next item was just written up in AQ Will Do, and it described how to get to these videos from within the AQ program itself. The Updates section provides a way to re-down load your program if needed along with 2 sample databases. The Newsgroup will allow you to join with other AQ users who discuss various aspects of AQ and provide community help to one another. When it comes to support and customer service, choose the best way to handle your needs but know AQ is there to help with software and technical needs in multiple ways. Remember comments and questions are always welcome! When it comes to organization, one of the easiest and yet least thought of is using color to help identify various lines. I teach a class about a system of color coding developed by my dear friend, Mary Hill, many years ago that helps one to keep files and documents organized by colors. This process once set up works very well, however, it can be a daunting task for anyone who has been doing genealogy for a long time. Mary's advice as well as mine would be to do this over a period of time. She has information on this system set up through "FamilyRoots Organizer", while some of the links are not working, there are enough sections working to see how it works. If you notice the color chart in the upper right hand corner, the colors match the above list although the colors are lighter. 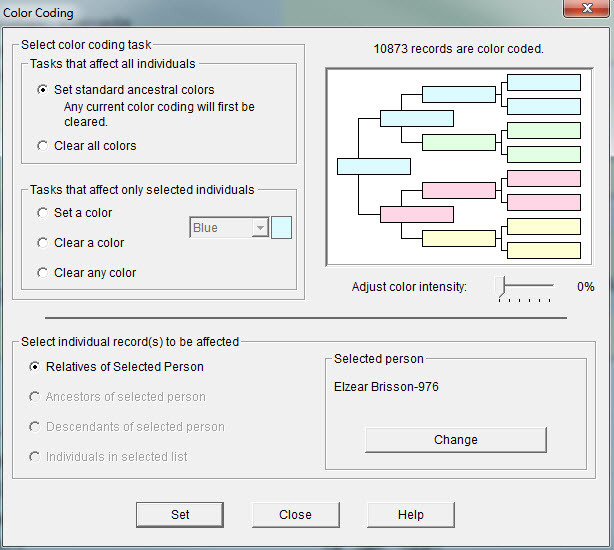 Note that the "Set standard ancestral colors" is selected. You can make changes here but if you are using this system you will always know which line you are in as you work in your database. Note that the colors are set according to the individual who is set in primary position. This coloring can follow into the printed fan charts too. Take advantage of these tools to help you as you work in your database, it helps a lot especially as you work on various lines. Beyond the "Quick Place Entry" in Ancestral Quest there are additional ways to speed up the entry of family and source information. Actual data entry can be cumbersome and seem to take forever, but with the implementation of keyboard shortcuts and the ones that are part of AQ, this process can be enhanced greatly. Most of us are attached to the mouse and often don't realize that there are quicker keyboard shortcuts that are done without the use of the mouse. While the mouse will do those things, the time it takes to remove ones' hands from the keyboard and use the mouse for a specific command, will consistently take additional time. Using the standard Windows shortcuts are throughout all the Ancestral screens. Looking at the top menu, "File, Add, Edit, View, Search, Tools, Internet, Collaborate and Help" all have underlines under specific letters which when combined with the "Control" key will take you to those drop down menus. Within each drop down the keyboard shortcuts are listed there for easy reference. 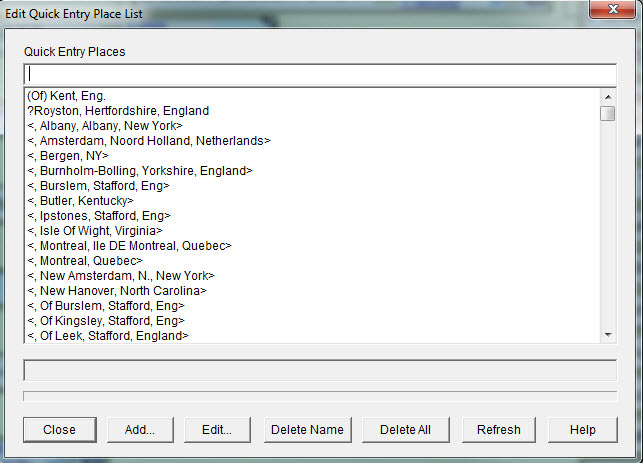 This is the drop-down menu under 'Add'. As you carefully look at the data entry screen above, you will easily notice that various letters are underlined, for quick data entry. Holding down the "ALT" key plus that letter will take you to that field or you can use "Tab" to get to the next field, either way it is very easy between the quick entry and using the short cut keys to enter an ancestor's information. This is where you are able to copy records within the family. If the information is the same in that field in the father, mother or older sibling, you just use the combination listed and it will populate that field with their information saving you having to type it in. In my case, I was born in the same location as my dad, so when I enter my birth place I would simply hold down the "Shift" key and the F8 together, this will put my dad's birth location in that same field for me. This is definitely a time saver and once you do this a few times you will remember the combination of keys. The Ditto Down key is a little bit different in that it copies from the screen you are in. So if the place of birth and death are the same, hitting the "F9" key at the death place will copy that information into the death field, again saving you data entry time. Of course one can still use the "Quick Entry Place" as mentioned in yesterdays blog, this list is compiled as one builds their database and the program will remember the place combinations as you begin to type them in. Hopefully this has been helpful to those struggling with adding in new and/or a lot of data. Remember comments and suggestions are always welcomed! Entering data can be a long drawn out process and yet it is necessary to record all the family births, marriages and deaths along with many other life events. To help with this process, Ancestral Quest has a "Quick Entry Place" feature which can speed up the entry of locations. 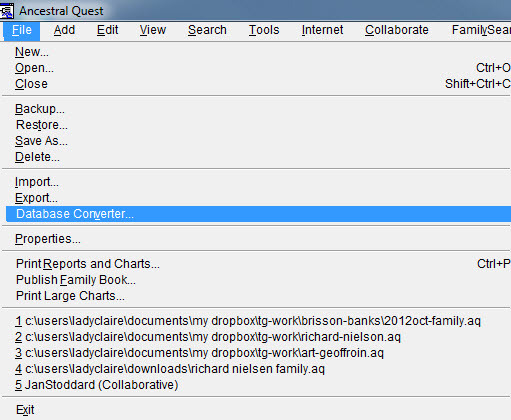 It is actually located under "Edit" on the toolbar at the top of the program. Sometimes this quick entry is a good thing as once you have entered in the actual location an event happened, it will automatically populate it if it is the same as you begin to type the location. There are pros and cons for this feature and it is good to note that it can be turned off if one wishes. In addition, you are also able to edit the "Quick Entry" section if you happen to have made a typo while entering in the locations. To remove a listing, start typing the location, once you've located the entry, either edit it or delete it and you should be all set from that point forward. One can choose from "Use Quick Entry (Advanced) and/or "Use Quick Entry (Simple). There is a difference between the two. The Simple version will fill in a place name from a list of completed places that you have recently entered as AQ remembers the last 30 place entered in the order of city, county , state or province and then country. The Advanced version will fill in the place names from a list of completed places that have already been entered and built up over time slowly by the same fields as listed above. If you don't want either of these then simply remove the check in the check box and it will not work. There are occasions when one may want to do this, but overall I have found it to be a great time saver. To see this in action, go to the AQ Quick Start Video and click on the "Quick Start - Entering a Family" located on the left side menu. 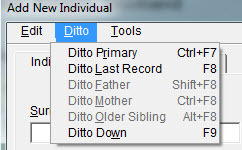 Tomorrow we'll discuss some additional shortcuts when dealing with data entry. You've finally made up your mind and decide to switch-over to Ancestral Quest so what now? It really is rather simple and will not take long before you wonder why you took so long to decide. The program can be purchased at this time with a $10 discount here. Of course you could still be a tiny bit unsure and use Ancestral Basics for a trial run, that is perfectly fine, just click here. Regardless of whether you are using the trial version or the full version the process is the same. Once you download the software and install it on your computer, opening the program will be the next step. You should see a screen shot like this one on the left. With that "open" area selected you will have the opportunity to open up your PAF file right inside the Ancestral Quest program, this is one of the reasons nothing is lost. Once you have saved your PAF file as an AQ file, all the functionality of AQ will completely work for you. With all your file in tact you are now ready to continue your research and working with your new program. 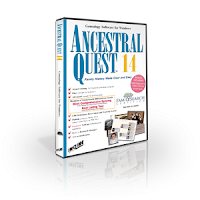 Ancestral Quest has some online tutorials in their Learning Center to help an individual get more familiar with many of the new features, to go there click here. If there are still questions or one is unable to figure out something, there is an FAQ section here and a "Contact Us" area which includes contact by phone, email, mail or as part of a forum, either way, problems and difficulties are addressed everyday as quickly as possible. As many genealogists and family historians know, PAF has been a mainstay since June, 1999 and for some, still is, in spite of the fact that it hasn't been supported or improved in a very long time. The history of PAF and AQ goes back to 1997 when PAF 3 was introduced with a different database structure. This prompted AQ 3.0 to have the ability to work with that new database structure. In 1999, PAF 4 and PAF 5 were created from the code provided to FamilySearch by Incline Software, in fact, PAF 4 was nearly identical to AQ 3.0 except for the different name and a few other minor variations. PAF 5 was last released in 2002, yet AQ has continued to improve and provide many new features that have made it a winner of multiple awards over the years. 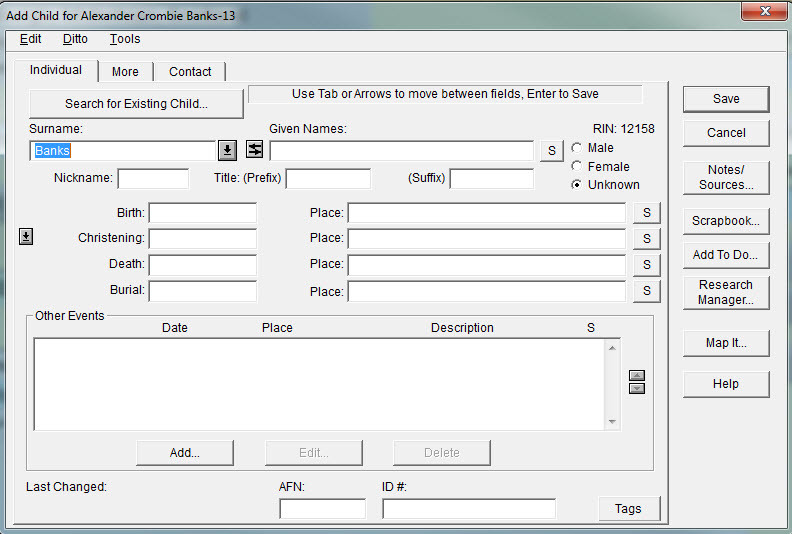 Switching over to AQ is as simple as opening up your PAF database from within Ancestral Quest, there is no GEDCOM files to create and import, nothing will be lost, and you will feel like you are working in PAF with a long list of improved features! Take advantage now of this easy switch over and the limited time offer for PAF users today! Lets face it, for many, genealogy is just a hobby and for others, it is a passion. Discovering one's family creates a sense of pride as well as a sense of identity and often can create greater family unity. Regardless of the reason one begins their family history research, choosing the right genealogical software program can actually enrich your experience and enhance your research skills. It helps if a user knows what they expect the software to do for them, however, if one is brand new to genealogy, knowing what to expect can be a daunting and seemingly impossible task. One of the first things most do is turn to their friends and ask what program they are using, however, the answers one received can add to the confusion. Another avenue is looking at reviews conducted by TopTenReviews and GenSoftReviews. Each of these sites provide ample information to help one learn about a particular software as well as a link to the software's website. 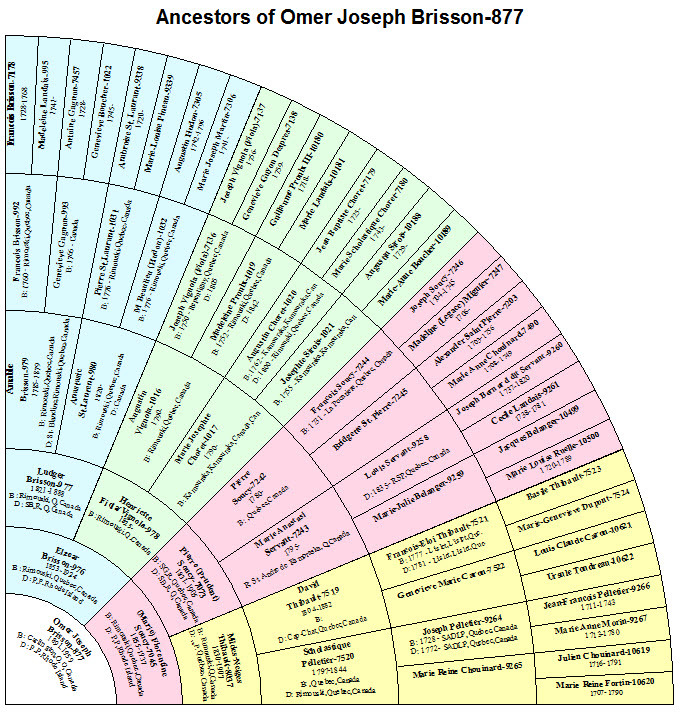 Ancestral Quest and the others listed above, as well as those not listed, have all these capabilities and more, however, the ease on how a product handles these minimal capabilities is what often sets a product apart from others and AQ has always been a step ahead in making it as simple as possible for a beginner yet powerful enough for the most advanced genealogist. Over the years, easy data entry, keyboard shortcuts, scrap-booking and excellent sourcing capabilities have been consistent award-winning features. 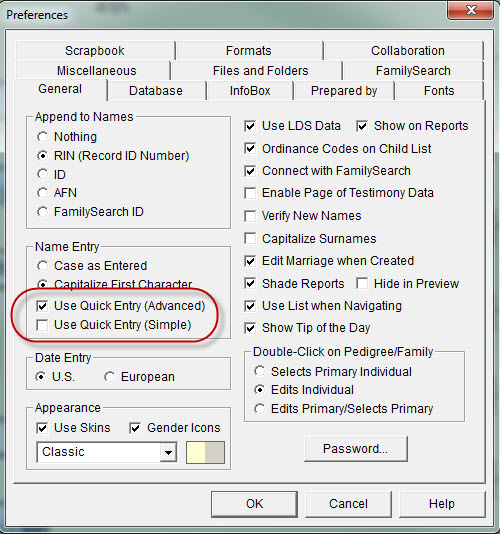 These features in combination with professional looking charts and consistently staying updated makes AQ the perfect program for managing your genealogical and family history data. To view a full description of this incredible but simple to use program click here. In both 2011 and 2012, Ancestral Quest was given the User Choice Award for being the easiest software to use as well as the most versatile genealogy program for Windows available today. It is a great program with a long list of award winning features for managing ones genealogical database, attaching documents and photos and so many other capabilities that both the beginner as well as professionals will find this program a perfect fit. Ancestral Quest 14 is the latest version and has many of the requested features along with being Family Tree Share Certified. This blog has been set up to discuss the features of this "must have" genealogy program for anyone involved in genealogy and family history. 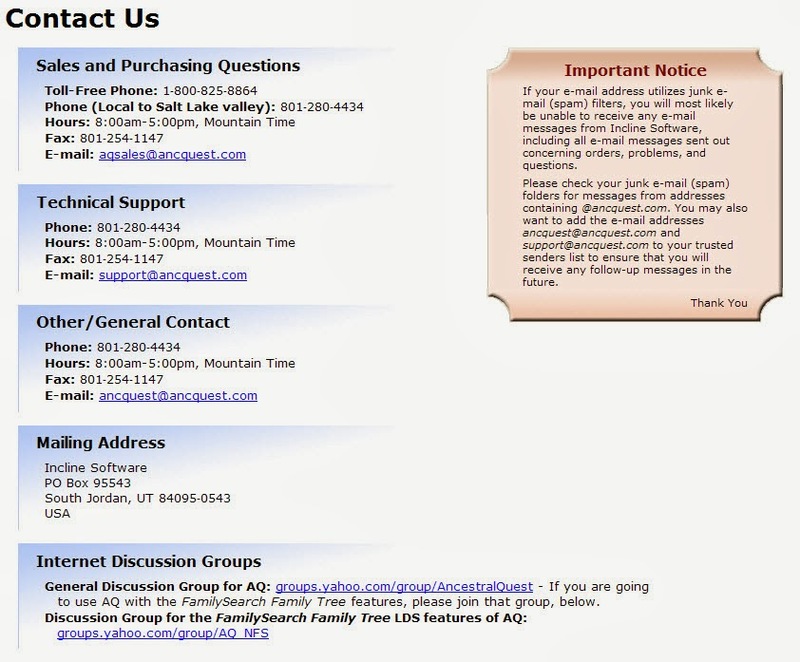 Feel free to add your comments going forward, all aspects of AQ will be discussed with screen shots which perhaps will open up opportunities to share cues and clues to others in the genealogical community who enjoy using Ancestral Quest to manage all their genealogical needs as well as those considering to use this program to manage their genealogical database.